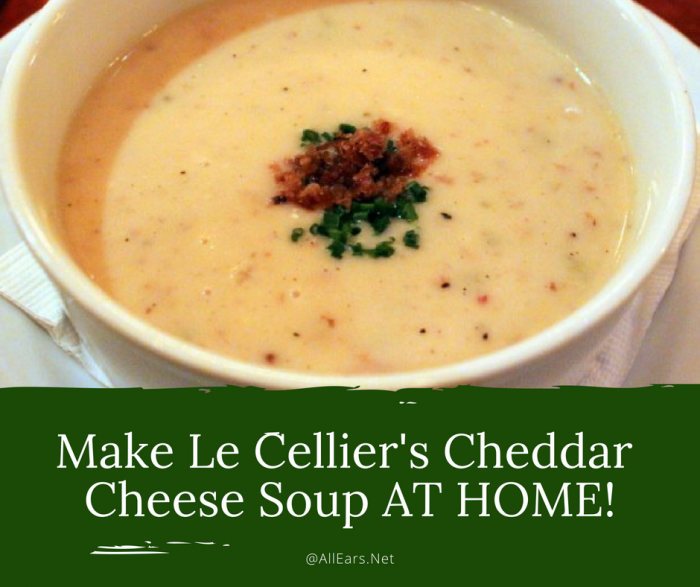 Anyone CAN COOK: Cheddar Cheese Soup! As Chef Gusteau says in the Disney-Pixar film “Ratatouille,” “anyone can cook”, and AllEars would like to help you recreate some of your favorite Disney foods at home. Now that winter weather is upon us, what better way to begin than with one of the most popular Walt Disney World recipes there is? This Cheddar Cheese Soup started out on the menu at the Canada pavilion’s Le Cellier Steakhouse, and has been served there and during Epcot’s Food & Wine Festival for the better part of two decades. It has been modified by Disney chefs over the years, but it is still a fan favorite. While I am not a chef, I am an enthusiastic home cook and foodie; here are some tips that I’ve found helpful over the years. First, ALWAYS read any recipe all the way through before you begin. Next is something that the French call “mise en place”, which means everything in its place. It is more than just gathering the ingredients, it is doing all your prep work before you start cooking. Measure your ingredients, chop your veggies, grate the cheese; I even line the ingredients up in the order I need to add them. It makes even complicated recipes easier to master. Now, on to the soup! Start by cooking the bacon over medium heat in a Dutch oven or large pot (this one is 4Â½ quarts). Cook for about 5 minutes, stirring often, until lightly browned. Tip: Instead of chopping the slippery bacon, I like to cut it into the pan using my “food only” kitchen shears. Add the butter, celery and onion, and cook for about 5 more minutes until the onion softens and starts getting translucent. Add the flour and cook for about 4 minutes, stirring constantly. It will get very thick and gloppy, but don’t panic. Then whisk in the chicken stock (I use low- or no-sodium stock so I can control the saltiness) and bring it to a boil for 1 minute. Reduce the heat, and simmer for 15 minutes more, stirring occasionally. Add the milk and keep simmering for 15 minutes. It is important to do this gently, you do not want to boil the milk, or it could burn/stick. Low and slow are the keys here. Remove from heat and add the cheese, and the Worcestershire and Tabasco sauces, stirring until the cheese melts and the soup is smooth. Stir in the warm beer. Add salt and pepper to taste. You can thin the soup with warm milk if it seems too thick. Garnish with chopped chives, and enjoy your edible visit to Canada! Cook the bacon for about 5 minutes over medium heat, stirring often, until lightly browned. Add the butter, celery and onion, and cook for about 5 minutes until the onion softens. Add the flour and cook for 4 minutes, stirring constantly. Add the chicken stock and bring it to a boil for 1 minute. Reduce the heat, and simmer for 15 minutes more, stirring occasionally. Stir in the milk, and simmer for 15 minutes. Do not boil after adding milk. Take the pot off the heat, and add the cheese, and the Worcestershire and Tabasco sauces, stirring until the cheese melts and the soup is smooth. Stir in the warm beer. Add salt and pepper to taste. You can thin the soup with warm milk if it seems too thick. Serve hot and garnished with chopped chives. What kind of cheddar do you use? Ive gone from crackel barrel to store brand etc and just can never seem to get the cheesy taste close to Le Cellier. What do you use and how close does it come? JOAN REPLIES: I use a very sharp, white cheddar — either Black Diamond (which is Canadian, by the way) or Kerrygold Aged. Unfortunately, they are pretty pricey. And is that “warm” as in just left out of the refrigerator for awhile, or actually heated on the stove a little? Thanks, Deb, for all you do as editor! “Magical Christmas” to all the staff of this website! DEBK REPLIES: In this case, “warm” means just out of the fridge for a while — as in, not ice cold. And thanks, Collette! Wishing a very happy holiday season to you and yours! How much warm beer? The recipe doesn’t say. DEBK REPLIES: oops, accidental omission. Sorry about that. 1 cup warm beer. I’ve amended the recipe. My daughter made an “Eating Around the World” cook book for a gifted IEP project. The cookbook included our families favorite recipes from our multiple visits to “The World”. Canadian cheddar cheese soup was my husband’s favorite so we helped her make the soup and photographed her journey. She got an A on the project and we got to have the soup for dinner! We have used other WDW recipes and they all take us back to a taste of ” home”!